Mexico's newest port, Puerto Costa Maya, is the first port on Mexico's Caribbean Coast to have been built exclusively for cruise ships and cruise holiday visitors. Situated on the Yucatan Peninsula, near the fishing village of Majahual, Puerto Costa Maya is the fastest growing cruise port in the Caribbean and consists of three grand pavilions in the ancient Mayan style. The grand pavilions are a commercial, cultural and entertainment hub offering dining, shopping and recreational facilities, a swimming pool and swim-up bar, local performances in the amphitheatre, and art and craft galleries showcasing the region's local artists and their art. In short, it has been custom-made to provide all the things cruise passengers could want on holiday and the carefully designed infrastructure is tailored particularly to holidaymakers. Beyond the pavilions, Costa Maya provides access to undeveloped areas of coastline, colourful reefs and shipwrecks for diving and snorkelling, and some ancient Mayan sites to explore. Puerto Costa Maya tour operators offer dune buggy tours, Mayan sites like Kohunlich and Dzibanche, and kayak adventures. Free shuttles transport passengers regularly between the pier complex and their ships. Passengers alighting from cruise ships in Puerto Costa Maya are carried by shuttle to the Mayan-inspired port complex, which boasts 70,000 square feet (6,503sq m) of shops and a bazaar. On offer are a wide variety of typical Mexican holiday souvenirs, especially local crafts, as well as designer perfumes, leather goods, and jewellery. The bazaar stallholders expect bartering to take place. The Puerto Costa Maya port complex contains some fast food outlets and eateries, but visitors docking here who want to enjoy a leisurely local meal can take a stroll into the fishing village of Majahual, where there are several small, rustic restaurants along the beach serving up Mexican favourites, as well as delicious lobster and fresh fish. For something a little upmarlet, try Leaky Palapa Restaurant. The Krazy Lobster offers cheap and delicious seafood right on the beach. As it is mainly a cruise destination, visitors to Puerto Costa Maya tend to be day-trippers who do not spend evenings at the port. Those who find themselves overnighting will no doubt be staying in a beach cabana in Majahual, where the only entertainment is to sip margaritas in an unsophisticated open-air beach bar under the stars. This lack of a nightlife scene is considered an advantage by some holidaymakers. Being a purpose-built cruise ship port, Puerto Costa Maya exists mainly to cater for shore excursions, and there is a huge range of these available for passengers. Excursions include bus tours to the Chacchoben Mayan ruins, bike and kayak trips along the coast, catamaran snorkelling expeditions, trips to the historic Bakalar lagoon, 4x4 drives through the jungle, and thrilling airboat rides. Alternatively, visitors can just enjoy some souvenir shopping, laze on the beach, or stroll into the nearby sleepy fishing village of Majahual. 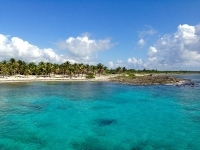 Puerto Costa Maya can sometimes experience hurricanes and tropical storms. Hurricane season runs from June to November and visitors to the region during this time should take care to check weather and storm forecasts.